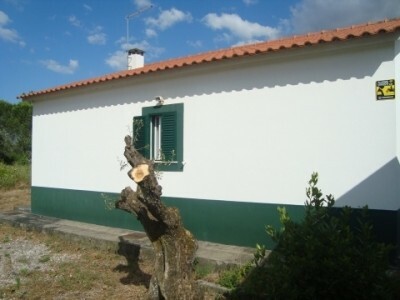 Three bedroom detached house for sale in the small hamlet of Madalena, Tomar, central Portugal. The main entrance leads directly into the living room which is open plan with the kitchenette. The living room has a wood burner stove for heating purposes , and the kitchenette is tiled, and fully fitted with hob, washing machine, fridge and the flooring is tiled. There are 3 bedrooms , all of these are good size double, bedrooms, and all with mosquito nets on the windows. The bathroom is tiled, has a shower, toilet, bidet and pedestrial sink. All the floors in the house are tiled, and all the windows, double glazed and have aluminium shutters. There is also a single storey garage with a window and aluminium shutter, and an automatic electric gate. The garden measures 4,000sqm, it is flat, and has a good selection of different fruit trees as well as some olive trees. The house is situated in a secluded area, though within walking distance to a restaurant , church, bars and cafes. The larger town of Tomar is approximately 10 minutes drive and has a good variety of supermarkets, cafes, restaurants, banks, shops, pharmacies, health centres, sports centre, library, university, hospital, bus and train station, historic monuments and the very popular market every friday. The closest airport to the property is located in Lisbon and is around one and a quarter hours drive by car. Lisbon airport is serviced by a variety of airlines. Operating regular flights into and out of the United Kingdom, other European countries and acroos the Atlantic.